Design a custom sign for your home or office. 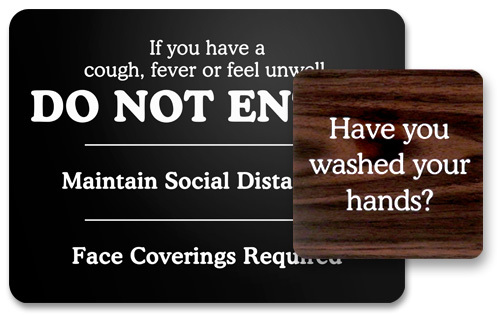 Laser engraved onto two-ply plastic these signs may be any size from 20 square inches to 144 square inches. The plastic is available in 29 color combinations. Our experienced designers will follow the instructions from the order page, and create a custom layout for you. A proof will be sent prior to production showing the layout of your sign and you will be able to work with the designer until the layout is approved. Custom signs will be engraved with your text. Prices start at $14.82 each | Pricing is based on size of the sign. Add a logo or graphic to your custom signs. $18.72 each | Pricing is based on size of the sign. Give the gift of recognition when you personalize these quality award plaques. With custom text and a graphic, plaques make excellent awards as well as personal gifts for special occasions. Use large custom plaques to feature artwork and important people at hotels, galleries, institutes and museums. Choose from a wide variety of woods and finishes to order the exact plaque awards you need. We carry a wide selection of award plaques. If you don't see what you want, give us a call and we'll help you find it. *39¢ each addtional square inch. 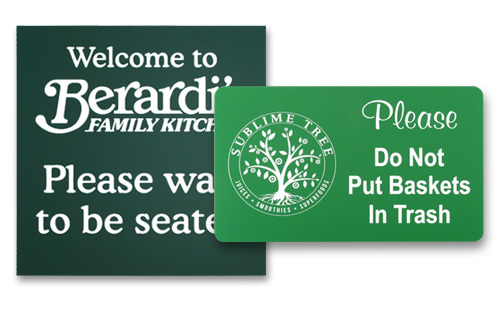 Custom signs can be any size within the following guidelines. We understand that you may not have the tools, time or desire to design your sign and we are here to help. Our standard set-up fee ($20.00 for 149 square inches or less | $30.00 for 150 square inches or more) includes up to 30 minutes of art/design time. (Most signs require less than 30 minutes.) If additional time is necessary, you will be advised prior to proceeding. If approved, additional work will be charged at $60.00 per hour. PRELIMINARY DESIGN: If you have an image or rough idea of the design you are looking for, please email/attach it with your order. Excessive text or complicated set-up requirements may increase the set-up fee. The standard set-up fee includes up to 30 minutes of art/design time. If additional time is necessary, you will be advised prior to proceeding. If approved, additional work will be charged at $60.00 per hour.